The Nobel Committee has just awarded the 2014 peace prize to Malala Yousafzai, 17, who becomes the youngest ever winner of the award since it was created. Malala Yousafzai is an advocate for girls’ education and for that, she was targeted by the Taliban in her native Pakistan when she was 14. 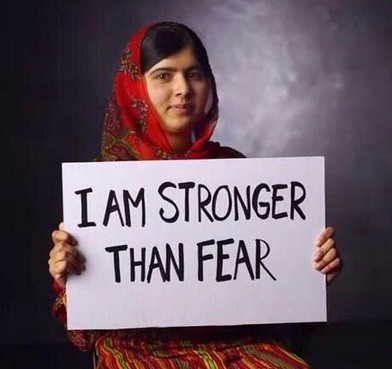 The taliban shot her in the head in an assassination attempt but Malala survived. Nominated for the Nobel Peace Prize last year, and backed by President Obama, Malala shares the award with 60 year old Kailash Satyarthi of India, a renowned activist and a veteran of campaigns to end child labor and free children from trafficking in his country. The Nobel Peace Prize is worth $1.1 million and will be divided equally between Malala and Kailash. Malala exhibited her big heart for young girls and education any where in the world when she joined the campaign earlier this year to #BringBackOurGirls after over 200 female students in Chibok were kidnapped and taken away from their school by men of Boko Haram in Nigeria. Malala is also an author and raises funds theough that and other means for the Malala Funds that goes towards the cause closest to her heart. Read. This is HOT. Aye Dee has been exposed. The ongoing world conflict in our time and the value promoted by the West are very well condensed into this real and yet media created fairly tale of hers. Sad to see an 11 year old girl became a fighter, almost lost her life, and has to live with the burden imposed on her by the conflict of our time.